During their final meeting before General Sir Ian Hamilton was dispatched to take command of the Allied expeditionary force that was ultimately to try and capture the Gallipoli Peninsula and open the way for a Franco-British fleet to subdue the Ottoman capital of Istanbul, Field Marshall Lord Kitchener made a disparaging comment on the state of moral of the troops Hamilton’s men would face. “Suppose one submarine pops up opposite the town of Gallipoli and waves a Union Jack three times, the whole Turkish garrison on the peninsula will take to their heels and make a beeline for Bulair,” Britain’s Secretary of State for War told Hamilton. Following their victory in the campaign, the Turks coined a phrase still used then referring to the deeds of 1914-16; “The Dardanelles were not passed”. In hindsight, both were wrong. On the morning of 26 April, having successfully navigated the Straits the day before, the captain of the Royal Australian Navy’s submarine AE2, Lieutenant Commander Henry Stoker RN, ordered the British ensign raised from the wireless mast of the vessel as it entered Turkey’s inland Marmara Sea. Contrary to Kitchener’s overconfident prediction, the Ottoman Fifth Army didn’t “take to their heels”, instead holding their ground and fighting every Allied offensive to a standstill. However, the reverse of the medal was that the Dardanelles were passed, with the AE2 merely being the first of eight Allied submarines to break through into the Marmara. 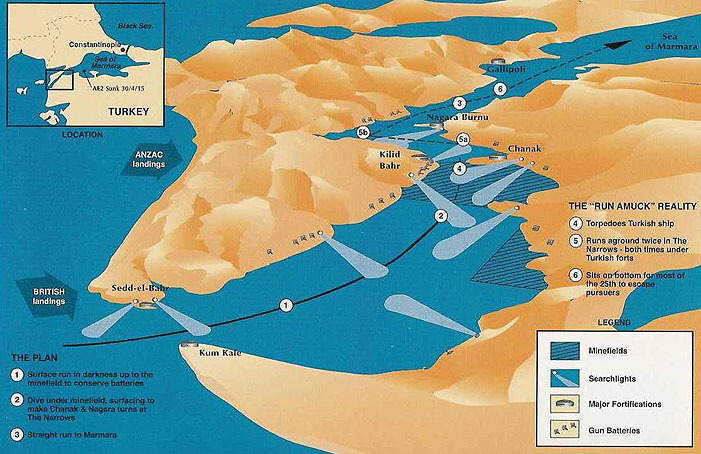 Though less well remembered than the land battles on the peninsula, submarines played a major role in the campaign, with Allied boats managing to pass through the Dardanelles on at least 14 occasions, with some British subs even attacking Turkish shipping in the Bosphorus, the first time enemy warships had entered Istanbul since its capture in 1453. The Allied subs had to brave a series of natural and man made obstacles in their fight to enter the Marmara, swift and swirling currents, mines and heavy nets strung across the Strait to ensnare them. During the campaign more than half those that attempted the passage were lost. Turkey’s ally Germany also had submarines active in the campaign, with one boat, the U21, accounting for two British battleships, the Majestic and the Triumph, in a space of three days. Both sides inflicted heavy losses on their opponents, with much of the Turkish mercantile fleet carrying supplies to the Ottoman army on the peninsula being sunk or damaged and a number of Allied troops ships and cargo vessels also being sent to the bottom with heavy loss of life. Wreck of HMS Majestic sunk by U21 on 27 May 1915 off Cape Helles. It is the story of these subs, their crews and their victims that Turkish film producer Savas Karakas, Australian historian Bill Sellars, underwater archaeologist Selcuk Kolay and salvage diver Enes Edis have joined forces to record in the documentary, ‘Gallipoli: War Beneath the Waves’. They have pinpointed the location of the submarines lost in the 15 month long battle between the Ottoman Empire and the Allies, and of the Turkish ships they sank. The project was carried out with the support of the Turkish Ministry of Culture and the Turkish Institute of Nautical Archaeology (TINA), a non-governmental organisation dedicated to the preservation of Turkey’s maritime history. The intensive work in the heavy seas and swift currents of the Dardanelles Strait resulted in the discovery of the wrecks of two British submarines, the E7 (depth:96m) and the E15 (depth:8m), and three French, the Saphir (depth:55m), Joule (depth:44m) and Mariotte (depth:5m). All were sunk while trying to pass through the heavily defended waterway during the campaign. Contrary to the belief that she broke in two pieces after being surface-bombed when caught up in the submarine nets, the E7 is sitting in one piece at the bottom very close to Turkish submarine Dumlupinar (Ex-USS Blower) sunk on 4 April 1953. The Saphir, which which was the first submarine to attempt the passage of the Strait, has also been recorded on film, as have the remains of the E-15. Using advanced sonar and side scanning equipment, the team combed the seabed of the Dardanelles, often having to dodge tankers and cargo ships plying the busy waters of the Strait. They were able to get the first film footage of the Joule, sunk on May 1 1915 off Kephez Point below the town of Canakkale when she struck a mine in the middle of the waterway. Joule had two deck-launched torpedoes and the dive to Joule very interestingly revealed the fact that the torpedo which was found by HMS Agamemnon free-floating on the surface after Joule’s sinking must have been its starboard torpedo, since the portside torpedo is still in place in its deck launcher while the starboard launcher is empty. Savas Karakas, Selcuk Kolay, Enes Edis on Detek Salvor before the dive Jouledive - Salvage Diver Enes Edis getting out from the bell at 44 meters and filming Joule Jouletorpedo – Secret solved 90 years later. Expedition team and the first dive to Joule at 44 meters. Thanks to the kind assistance of the Turkish Navy, the team was able to get access to otherwise restricted waters and have the opportunity of a life time, to stand on the wreck of the French submarine, the Mariotte, which lies in shallow waters within the grounds of a naval base at Nara. 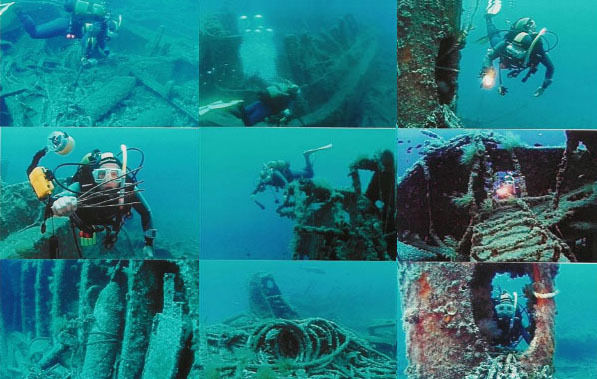 French sub Mariotte in 1915 and in 2005 in the Dardanelles. The focus of attention then shifted to the Sea of Marmara, where the crew dived on the wreck of the Rehber, an Istanbul Bosphorus ferry used to carry troops and supplies to the Turkish army on the Peninsula, and the Nur-ül Bahir, a Turkish gunboat sunk by the British submarine E14. They then filmed the wreck of the Australian submarine the AE2, using both an ROV and hand held cameras. AE2, the first sub to pass through the Dardanelles was sunk on April 30th. 1915 by Turkish torpedoboat Sultanhisar off Karabiga. Nur-ul Bahir sunk by E14 and Turkish torpedoboat Sultanhisar which sunk AE2. Since the E20 which was torpedoed by UB14 is lying at a depth of approx. 800 metres north-east of Marmara Island, only E14 still remains to be found which lies with its 27-man crew near the Dardanelles entrance. This will be the team’s next goal in the coming summer. Besides Bill Sellars, amongst those interviewed for the program have been the Gallipoli Association’s Michael Hickey and Kenan Celik, one of Turkey’s leading experts on the campaign. Certainly the most valuable contribution came from the distinguished descendants of Duncan Dunbar-Nasmith of the E11 and the honorable Turkish corporal Mustecip’s, who shot and caused the capture of the French submarine Turquoise in the Dardanelles. Lt.Cdr. Nasmith, Commander of HMS E11 and Turkish Corporal Mustecip. The documentary produced in 2006 on the voyage of discovery to locate and film the lost submarines of the Gallipoli Campaign was aired on İz Tv and CnnTurk in Turkey. The film consists of two episodes and the total duration is 85 minutes. It is hoped the documentary will have an international release at a later date. Turkish battleship Mesudiye sunk by HMS B11 under the command of Lt. Holbrook on 13 December 1914. French sub Turquoise commissioned as Mustecip Onbasi.